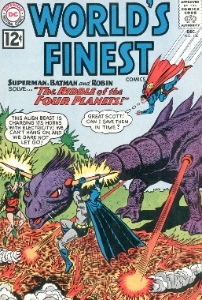 I have 1 DC comic book, World's Finest - Superman, Batman and Robin solve... The Riddle of the Four Planets. Condition is good, no missing or ripped pages, some yellowing of paper, spine slightly curled. What is it valued at ? Thanks. Editor's reply: In the condition yours is described at, I'd say it's worth around $60-75. You can see examples of World's Finest #130 which sold on eBay. The record for this book was $448 back in 2008 for a 9.6-graded comic. A 9.4 sold for $227 in Feb 2013. From the description, yours sounds like about a 7.0 to maybe 8.0. Good luck with it.